The following biography, short history and interesting facts provide helpful information for history courses and history coursework about the life of Edward V and the Princes in the Tower. King Edward IV left several daughters and two sons--Edward, Prince of Wales, who was thirteen years old, and Richard, Duke of York, who was eleven. Edward was at Ludlow Castle, where the princes of Wales were always brought up, with his mother's brother, Lord Rivers; his half- brother, Richard Grey; and other gentlemen. When the tidings came of his father's death, they set out to bring him to London to be crowned king. Because he was only thirteen years old, and a minor, his uncle Richard, Duke of Gloucester, was entrusted as Protector of his young nephews. Richard had always been a loyal and trusted supporter of his brother King Edward IV, who was the boys father. The coronation of the young prince was set for 22nd June 1483. Strong doubts were cast on the legitimacy of the two little princes by Robert Stillington, the Bishop of Bath and Wells, Lord Chancellor of England. Robert Stillington presented evidence that King Edward IV had contracted a secret marriage to Lady Eleanor Talbot in 1461 who was still alive when he married Elizabeth Woodville in 1464. Lady Eleanor Talbot died in a convent in June 1468. 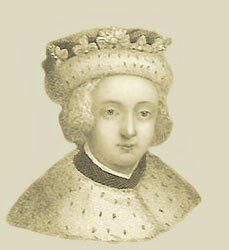 The marriage between King Edward IV and Elizabeth Woodville was declared a clear case of bigamy, which invalidated their marriage, making their children illegitimate. The two little princes had no idea that anything was wrong. They trusted their uncle and Protector Richard of Gloucester and were awaiting the coronation. Their uncle Gloucester intercepted Edward’s entourage as it travelled to London. Many of the young king’s supporters were killed and William Hastings was arrested on a charge of treason and imprisoned in the Tower. Edward was escorted to London and then to the Tower. On the 16th June 1483 he was joined by his brother Prince Richard. The coronation was cancelled. On June 25 1483, Parliament declared the two little princes illegitimate and, as next in line to the throne, their uncle and Protector, Richard, Duke of Gloucester, was declared the true King. The two little princes were never seen again. Some years later, two men confessed that they had been employed to smother the two brothers with pillows, as they slept. In 1674 two skeletons were discovered in the White Tower under the stairs leading to the chapel. The skeletons were subsequently reburied in Westminster Abbey as ordered by King Charles II. The skeletons were believed to be the remains of the bodies of the two tragic Little Princes, Edward V and his younger brother Richard, Duke of York. Interesting facts and information with a short biography about the Medieval Life, Times and history of Edward V one of the Princes in the Tower. Additional useful details, facts, history, biography, timeline and information about the lives of all of the Medieval Kings of England and the important events which occurred during their times, can be accessed via the Medieval Life and Times Sitemap. The content of this article on Medieval life and times provides free educational details, facts and information for reference and research for schools, colleges and homework for history courses and history coursework.